1. Get in touch on our contact page and tell me what you want. Include your FULL SHIPPING ADDRESS. 2. I'll send you your total with shipping included. 3. You send your payment via PayPal or by mail. 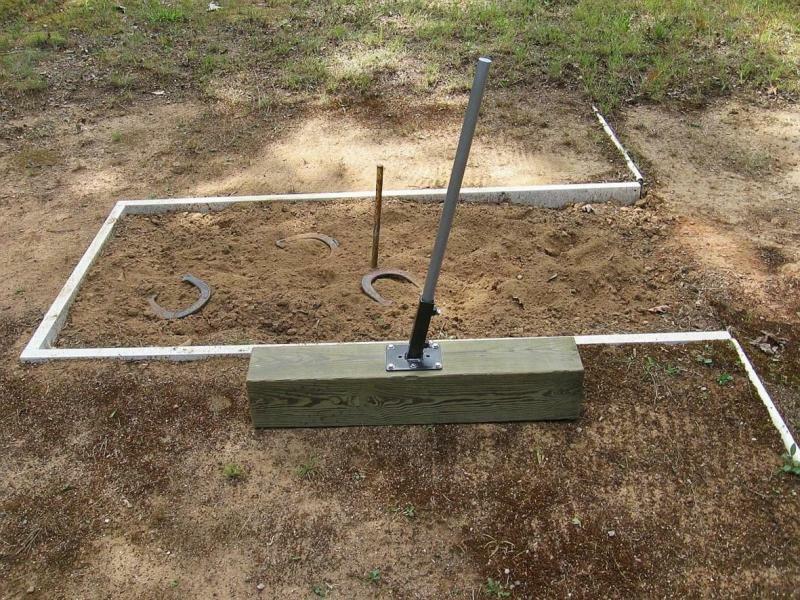 I grew up pitching horseshoes at my grandparent's house on a makeshift court. 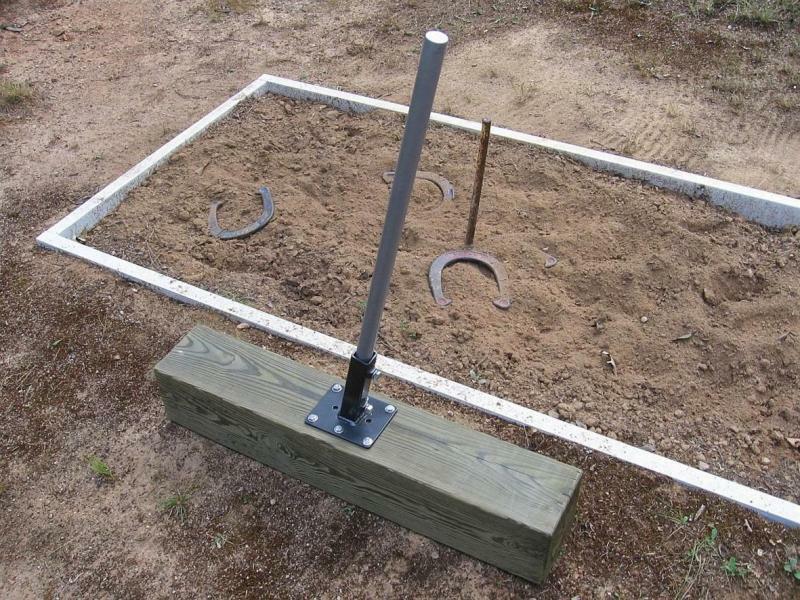 So, about ten years ago, I decided to put a horsehoe court in the back yard. It was nothing special, just a starter set I purchased locally at a department store. But I measured everything out correctly, installed boxes around the pits and anchored the stakes into blocks of pressure treated wood and buried them as suggested. It was a pretty good court for a first time effort, better than the one at my grandparents', but one of the stakes finally sank into the block of wood so that only about 4" was left protruding out of the ground! I also did not achieve the proper 12 degree angle of forward tilt, so the little undersized 3/4" stakes that came with the set were always bad about bouncing off ringers. So recently I decided to upgrade my ten year old, heavily used court with some regulation sized stakes and fabricated steel holders that would easily produce the 12 degree forward tilt and not allow the stakes to sink over time. The following photos are of what I came up with and we will now be offering these for sale here on the website for fellow horsehoe pitchers. Design is patent pending. 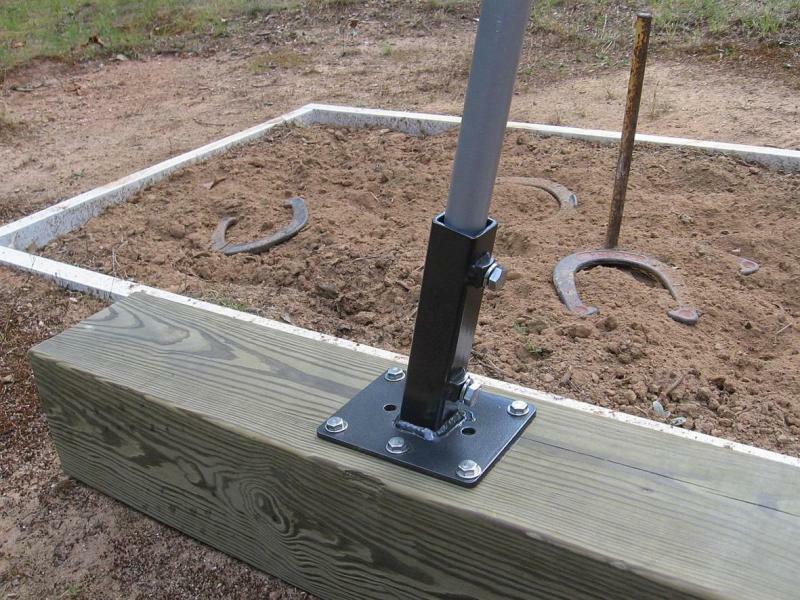 New horseshoe stake holders. 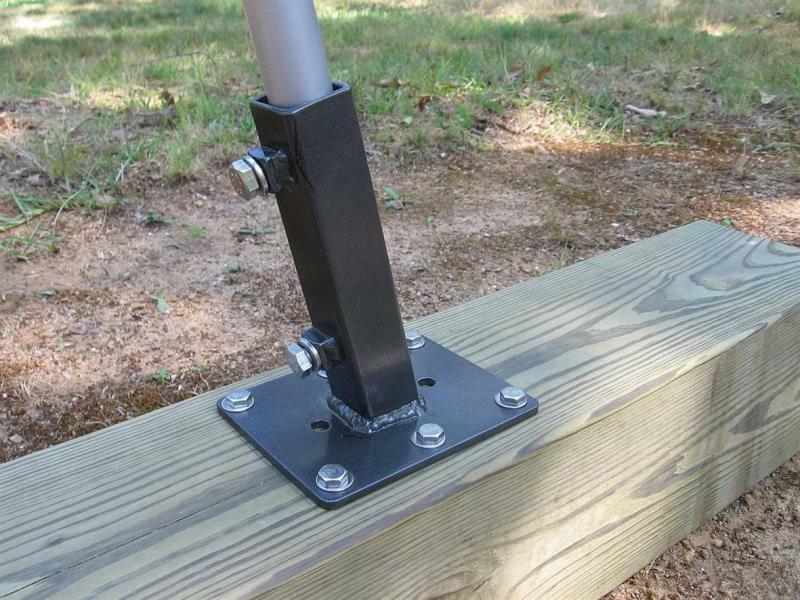 These fabricated steel stake holders hold a 1" diameter stake securely at a 12 degree angle and are bolted to a length of pressure treated 6 X 6 with lag bolts. The 6 X 6's shown here are 30" in length and and work fine. You could go up to a 36" length if you wanted to but anything longer is unnecessary. Then the 6 X 6 is buried in the center of your pit so that 15" of the stake is left protruding. You'll need to dig your trench about 14-1/2 to 15 inches deep to allow 15 inches of stake to protrude out of the sand pit. With these holders, you'll never have to worry about the stake getting knocked backward or sinking over time. Stake holders are $90.00 per set of two, plus shipping. Send me your full address for an accurate shipping quote. These are difficult to keep in stock. Send me an email to check availability. Design is patent pending. Keep in mind that the only we are set up to take online payments is through P﻿ayPal, meaning you will need a PayPal account to pay with a credit card. If you don't have a PayPal account, you can mail a check or money order. Two stainless steel 3/8" bolts hold the stake securely in the holder. Stainless lock washers prevent the bolts from coming loose. The holder is fastened to the 6 X 6 with six 1/4" lag bolts. *Note: new models attach to the 6 X 6 with four 3/8" lag bolts at the corners. Lag bolts are not included. Pick those up at Lowe's or Home Depot when you get your 6 x 6. These are the new, current models with 1/4" thick base plates and four 3/8" mounting holes. I painted these with some metallic gray Rustoleum I had left over from a custom paint job on a launch pad, but the ones we sell will be painted with whatever color rust preventive paint I have on hand, usually black. If you want to spray cold galvanizing compound over that, be my guest. We also have 1" diameter stakes available for $30.00 per pair. The new stakes are a slightly shorter 24" long, so no more digging half way to China to bury them. Dig depth is now 14-1/2 to 15 inches. They're hot rolled steel and they're sold as bare, unpainted steel so you can paint them the high visibility color of your choice. A word about shipping these: If you're purchasing the stakes with holders, the shipping weight of the box is right at 18 pounds; meaning that even if you lived right here in South Carolina, it'd cost me more than 5 or 6 bucks to ship them to you. So don't be surprised if the shipping is 18 to 20 dollars and if they're going all the way across the country, even more than that. I think I have already given a couple of people heart attacks when I told them it would cost 25 or 30 dollars to ship their package, and keep in mind, I profit absolutely nothing from the shipping cost. You pay the actual cost incurred. And since it takes 10 to 15 minutes to pack them up and print the shipping label (time I don't charge for), the shipping part of this is technically a losing proposition for me. Just keep this in mind. Thanks.